Jackson Crossing, located at 120 East Reed Avenue, is AHC’s first affordable apartment community in Alexandria. The 78-unit complex includes one, two and three-bedroom apartments, and serves families earning 60% or less of the area median income (AMI). 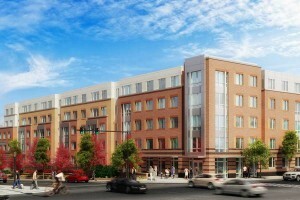 The project is located on Route 1 across from the Potomac Yards shopping center, and has excellent access to a bus rapid transit route and the future metro station at Potomac Yards. Through a partnership with the City of Alexandria, AHC received a $2.5 million loan and the transfer of a city-owned parcel of land at 3600 Jefferson Davis Highway for the project. Six privately-owned parcels controlled by AHC make up the rest of the consolidated plot. Jackson Crossing provides underground parking, a rooftop patio, onsite management, and a community space that will be used primarily for educational programming. AHC will coordinate with The Campagna Center, an Alexandria nonprofit, for the education programs. Additional partners include Bonstra-Haresign Architects, Harkins Builders, Hudson Housing, Low Income Invest Fund (LIIF), NeighborWorks, and the Virginia Housing Development Authority.